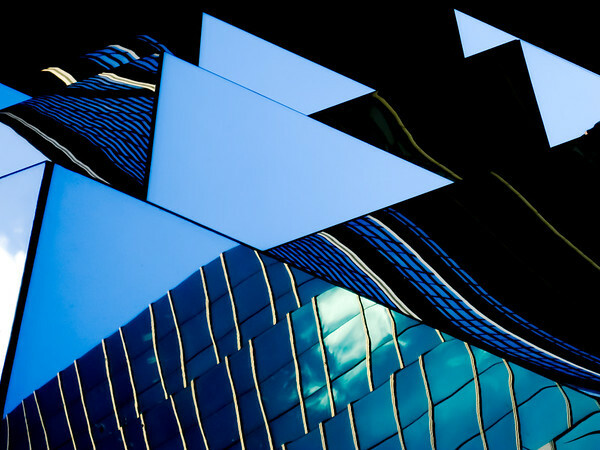 A rather abstract photograph from the "reflections" gallery in the "man made beauty" collection (it was already shown off in this post). The photograph shows glass pyramids reflecting the sky line of Hong Kong. I have taken this photograph in 2010, while I enjoyed a few free hours after an exhausting working weekend. It was a very hot and humid afternoon with beautiful lights and shadows and plenty of photography opportunities. I may post a few more photographs in the coming days. I like about reflections that they show the usual in unexpected and new ways. Here, the different surfaces of the glass pyramids reflect buildings and sky from different orientations and stack these reflections behind each other, which I quite like. In addition, I find the interplay between the clean surfaces and the distorted reflections of buildings very interesting and blue is one of my preferred colors. I hope you enjoy. P.S. The photographs in my blog usually link to the photograph on www.floriansphotos.com. Recently, I have been fighting with the slideshow on the HOME page and with the gallery view. Things should be more or less fine again, but I am sorry that the site was partly out of order over the weekend.